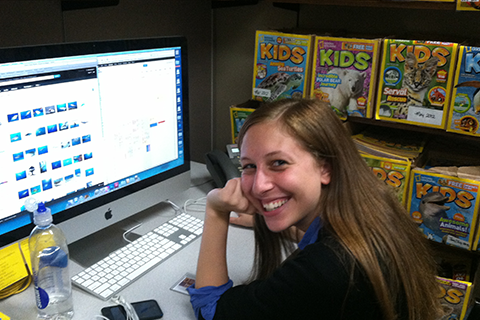 Rachel had a great summer internship with National Geographic. She worked in Children's Publishing during her internship. Andrea was an intern at Newlink and worked as a Human Resources Intern. 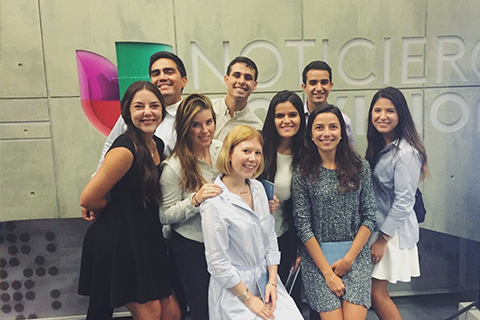 She had the opportunity to visit Univision during her internship. The Toppel Internship Program (TIP) provides a FREE way for you to gain academic credit for your internship experience. The 1-credit notation counts toward overall credits; however, it does not count toward graduation credits or GPA points. NOTE: To obtain credit toward graduation credits, you should seek out your Academic Advisor/Dean to discuss. Not every major/college at UM has this option. Students must have an internship offer in order to register their experience and participate in TIP. To register your experience, you must complete the learning contract. If your internship will be over the course of multiple semesters, you must submit a new learning contract for each semester. Some internship applications require proof that academic credit can be earned when applying. In order to request the letter verifying you are eligible for credit, please complete this form. Once you receive an offer, you should plan to enroll in TIP and participate in the orientation session. International students in need of Curricular Practical Training (CPT) authorization must participate in TIP because proof of enrollment in at least one internship credit is required by law. Please allow up to 10 business days for the process to be completed. It is extremely important that you plan ahead. Do not wait until the last minute because you CANNOT begin working without completing each step and receiving authorization from ISSS. You can participate in TIP whether your internship is paid or unpaid. If it is unpaid, we strongly recommend you participate so that you walk away from the experience with tangible compensation in the form of academic credit. Generally you will engage in either a part-time internship or a full-time internship. NOTE: International students under CPT cannot work more than 20 hours per week during the Fall/Spring and cannot work more than 40 hours per week during the Summer. Internships are generally offered for one semester. You may find that your employer wishes to hire you for an academic year or multiple consecutive semesters. As long as you are open to this, Toppel will support your internship experience through TIP. The academic calendar can be used as a guideline if you are in need of specific dates for your internship. We do recommend that you consider your academic obligations and build your schedule to accommodate for busier times (e.g., projects, papers, finals). While Toppel does not have a specific requirement for the length of your internship, we do want to ensure that you are getting a meaningful experience. If you have specific questions or concerns about the length of your internship, please contact Anna Kenney at toppel-internships@miami.edu or 305-284-5451. NOTE: International students under CPT are only authorized to work during specific dates which are based on the academic calendar. Some internships require a signed internship agreement between the organization and the internship site. Certain countries abroad also require these agreements. The University of Miami is committed to supporting our students in their internship endeavors. As such, we have developed an internship agreement sample that we are able to provide to students in need of an agreement. Students must also participate in the Toppel Internship Program. This process will take at minimum 3-5 business days. If you have specific questions, please contact Anna Kenney at toppel-internships@miami.edu or 305-284-5451.